The entire staff of media agency Spark Foundry have taken a day to reflect on their own mental health to mark World Mental Health Day today. As the Spark Sydney and Melbourne offices close today, the agency has asked its staff to donate a minimum of $10 to 1010, the World Mental Health Day charity. In addition, staff have been asked to make a promise via the World Mental Health Day website and save it as a JPEG, with all promises now featuring on the World Mental Health Day ‘Promise Wall’ at the agency’s Sydney and Melbourne offices. 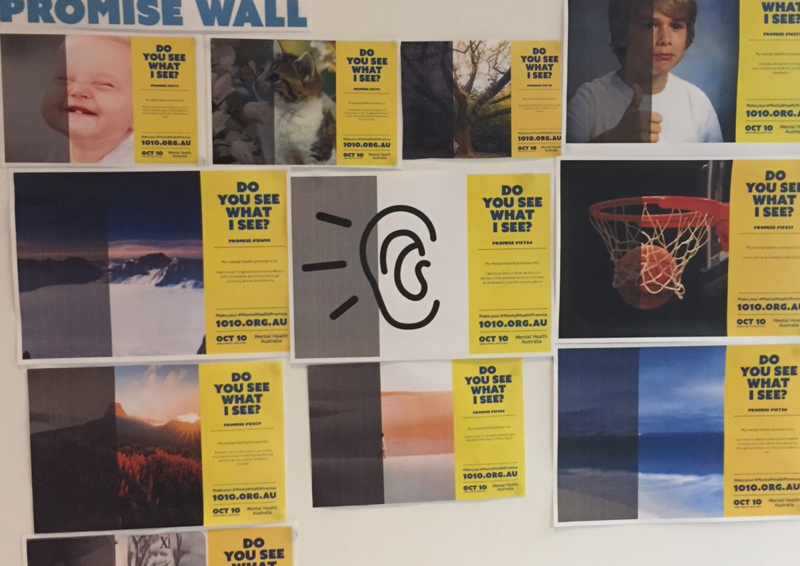 The ‘Do You See What I See?’ #MentalHealthPromise initiative challenges perceptions about mental illness in Australia and encourages everyone to look at mental health in a more positive light, in an effort to reduce stigma and make way for more people to seek the help and support. Some of the Spark staff promises include “lunch with my Mum”, “hanging out with my puppy”, “cook a fancy dinner”, “gardening”, “haircut and facial”, “play basketball”, and even “chores”. World Mental Health Day is a day for global mental health education, awareness and advocacy, and is an initiative of the World Federation for Mental Health to raise public awareness of mental health issues worldwide. “The mental health of our people that work in such a fast-paced industry needs to be constantly front and centre in our minds,” Spark CEO Sue Squillace said. “Our people are passionate about this cause, and our clients have been amazingly supportive of our decision to close the office to give their teams a chance to take some well-deserved time to out to breathe. This is one of several initiatives Spark has introduced at the agency to care for the wellbeing of its staff, which also include a yoga ‘Zen Den’, staff bootcamps and the opportunity for mothers to work from home. Spark has also partnered with The Gidget Foundation to support the charity, which will in turn host a wellbeing session with staff next month. Peter Butler managing director of Spark’s Melbourne office, said mental health is a much publicised but still much misunderstood illness. “As a dad of two teenage boys, I am acutely aware of the pressures they face. A day like this makes you reflect on the importance of making time with them and talking to them about life, not just football,” he said.